The walls of Jericho loomed large over the Israelite camp below. The city appeared ready for the looming battle of Jericho. From inside the city walls the people must have surely watched as the Israelite nation crossed the Jordan, and set up camp within eye sight. However, it is doubtful that the people of Jericho really feared for their lives. The fortifications of Jericho were massive. And when one hears of the ancient city of Jericho, the firs thing which comes to most minds are the famous walls of Jericho. These walls were structured on a three tiered plan. The walls started with an earthen rampart, or embankment, which ran from ground level upwards on an incline to a stone retaining wall - the second tier. 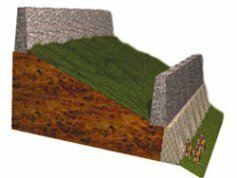 The stone retaining wall stood 12 to 15 feet in height (4-5m) on top of the earthen embankment, as the digital image below depicts. On top of the stone retaining wall, stood another wall made of mud-bricks, 6 feet (2m) thick, and 20 to 26 feet (6-8m) high. Together these two walls combined to form a fortification 32 to 41 feet high. To put this into perspective, envision a 4 story tall building. Such was the height of the walls of Jericho. On the other side of the double wall, the embankment continued to climb upwards. The third tier was at the very top of the embankment, where yet another mud-brick wall stood. At their base, the walls of Jericho stood 46 feet (14m) above ground level outside the retaining wall. To the Israelites below, Jericho seemed impenetrable. 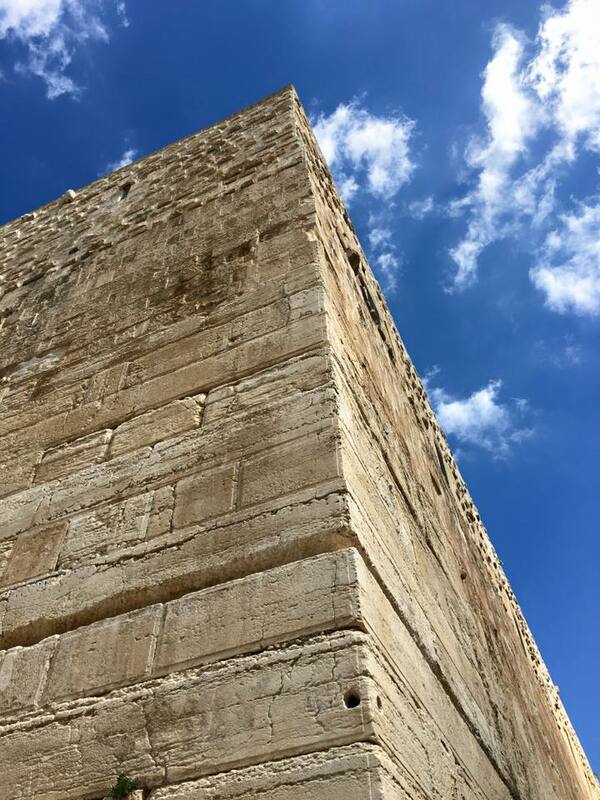 The massive Western Wall of the Temple Mount built by King Herod. The illusion created by the two walls on the bottom, and the large wall at the crest of the embankment, seemed to stand nearly 10 stories in height from ground level! From this height, the Israelites must have seemed like ants, and surely were deemed no threat whatsoever. The fact that God instructed Joshua and the Israelites to walk around the city, would suggest that the walls of Jericho were not that wide in diameter. In fact, the upper city, contained within the top walls of Jericho, was only 6 acres. However, the area of the Upper City, combined with the fortification system, was about 9 - 10 acres total. With this in mind, it is very plausible that the Israelites could march around the city several times in one day. The population of Jericho, within the Upper City, was probably around 1,200 people. However, people were living in the space between the walls of Jericho, on the embankment, and houses were built as part of the wall as well. When archaeologists' discovered this fact, the Bible was once again verified unintentionally by science. Rahab immediately comes to mind. The book of Joshua relates how her house was built into the walls of Jericho. The spies escaped out of her window, sliding down the walls of the city. She then hung "cord of scarlet thread" out of her window. The scarlet thread would have been plainly visible if her house were indeed built into the walls. Though often it may seem the Bible provides confusing details, this one story proves remarkably accurate! People in the surrounding villages would have also fled to Jericho for protection and safety from the marauding Israelites. Consequently, Jericho's population would have swelled to several thousand. Jericho was well prepared for a siege. The harvest had just been gathered (Josh. 3:15), so there was an ample food supply. The Ein Al-Sultan spring was located within the walls of Jericho. This spring alone provided more than enough water for the entire population. Thus the battle of Jericho appeared strategically in their full advantage. The fortifications were plenty strong to withstand any attack by invaders. Jericho was an impregnable fortress, with plenty of resources and supplies within the city walls. Joshua, however, was not deterred. The city of Jericho loomed like a mountain in the distance. The Israelites had been on the move, and had a tremendous amount of momentum after the miraculous river crossing. Joshua had been affirmed by God in front of the people. The local villages had been abandoned, and the "The City of Palms" had been locked up airtight. The Israelites were poised to strike. God had other plans. He instructs Joshua to make flint knives, and circumcise the men of Israel (Joshua 5:2-9). In a similar fashion, Israel had been circumcised as they left Egypt. However, circumcision had been neglected as the Israelites wandered the desert. This must have seemed like a strange time for God to command this. Yet, as this was a sign of man's commitment to God, and part of God's covenant with Abraham , it was vitally important that Israel be sanctified before going into battle and entering a new phase of their existence as a nation. Without hesitation, or argument, Joshua obeyed, and the nation of Israel was circumcised on the banks of the Jordan River. God had tested them, and their obedience led God to "roll away the reproach of Egypt" (5:9), a consequence of the previous generation's disobedience in the desert. The place became known as, "Gibeath-haaraloth", or, "the hill of foreskins". God's people were now in full compliance with His decrees. After their circumcision, the Israelites celebrated the Passover (5:10-12). The Bible tells us on the fourteenth day of the month they celebrated the Passover. Their celebration must have seemed eerily strange from on top the towering walls of Jericho. On the fifteenth day, they ate ate from the land of Canaan. On the sixteenth day, for the first time in forty years, the manna did not appear. God had cut off the provision of manna, for now they ate "of the produce of the land of Canaan". As God had delivered them out of the land of Egypt, He was now going to deliver them into the land of Canaan. Joshua 5:13-15 records an interesting encounter. "Now, when Joshua was near Jericho, he looked up and saw a man standing in front of him with a drawn sword in his hand.Joshua went up to him and asked, 'Are you for us, or for our enemies?' 'Neither,' he replied, 'but as commander of the army of the Lord I have now come.' Then Joshua fell face down to the ground in reverence and asked him, 'What message does my Lord have for his servant?' The commander of the Lord's army replied, 'Take off your sandals, for the place where you are standing is holy.' And Joshua did so." The Bible doesn't say what Joshua was doing. We are told he was "near Jericho", and nothing more. Perhaps he had finished walking through camp, checking on the people and supplies. Maybe he had been scouting the land around Jericho, looking for any potential ambush sites. More than likely, Joshua had been in prayer with the Lord. The appearance of this visitor was sudden. Apparently Joshua did not recognize the man's uniform, only that he had a drawn sword in his hand. It is interesting that Joshua's reaction was not one of alarm, but rather curiosity. He asked him which side was he for. The soldier answered, "Neither..". He was the commander of the army of the Lord, perhaps suggestive of the archangel Michael. Jude 9 mentions that the archangel Michael had disputed with the devil himself over the body of Moses. Michael is also associated with Christ's second coming in 1 Thess. 4:16. It is also Michael who battles the fallen Watchers in the book of Enoch , again per God's divine instructions. 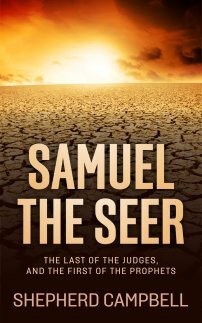 Leading the Israelites into the Promised Land would certainly fit a mission Michael would be assigned. Michael's sole concern are his orders from God. The battle of Jericho is not man's fight, but God's. The Lord then commanded Joshua as to how to structure the invasion. The "armed guard" (6:9) was to march first in line. They were followed by seven priests carrying "trumpets of rams' horns" (6:4). These trumpets were blown continuously throughout the march around the walls of Jericho. The priests responsible for the ark of the covenant followed behind, with the "rear guard" (6:9) behind them. Scripture is not exactly clear as to the rest of the procession, but it is common belief the rest of the Israelites fell in behind the rear guard. Joshua was very precise in his instructions to the Israelites, as God had been very precise with His instructions to Joshua. The people were to march in this fashion once a day, for six days, with the trumpets blowing. Yet, Joshua instructed the people; "Do not give a war cry, do not raise your voices, do not say a word until the day I tell you to shout. Then shout!" Once again Joshua had been very clear in his instructions. After the seventh time they marched around the walls of Jericho, after the trumpet blasted, Joshua would give the order and the people were to shout. Upon hearing their voices, God would tumble the walls of Jericho and give the city to His people as a sign of their obedience. Joshua issued orders that nothing was to be touched, or taken, except the things that had been devoted to the Lord. All people, men, women and children, young and old, were to be killed. The silver, gold, bronze, and iron were to go into the Lord's treasury. The devastation was to be complete. Only Rahab, and all who were under her roof, were to be spared. On the seventh day, after the seventh time around the walls of Jericho, Joshua gave the command, and the Israelites gave a shout. The Bible says, "the wall fell down flat". 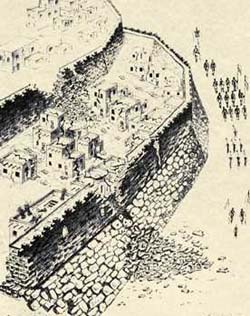 The Hebrew suggests that the city walls of Jericho fell beneath themselves. In fact, excavations have shown that the bricks from the collapsed walls of Jericho formed a ramp against the retaining wall. The Israelites simply "went up into the city, every man before himself" (6:20). They then "utterly destroyed everything in the city", as they had been instructed. The only persons spared were Rahab, and those that had been with her in her house. Joshua cast a curse on Jericho in the waning verses of chapter 6. This curse concluded the Biblical account of Jericho's role in the conquest of the Promised Land. Though the most famous role of Jericho in the Bible, the ancient walls of Jericho remained through the reign of David. The ancient city rests less than two miles from modern day Jericho. How tall were the walls of Jericho? Are the unearthed walls of Jericho the ones mentioned in the Bible? Click on the link above to give us your insight, thoughts, comments, and questions!